THE FAMILY PANEL represents the story of Eve’s life. Placed on a film clip as her life was very much in the public profile throughout her life – spreading the message of love, determination, great wisdom, the breaking down of prejudice, family commitment, and the issues of HIV and AIDS. The pictures start at birth, 17th July 1982, 995 grams born, through to her first birthday. 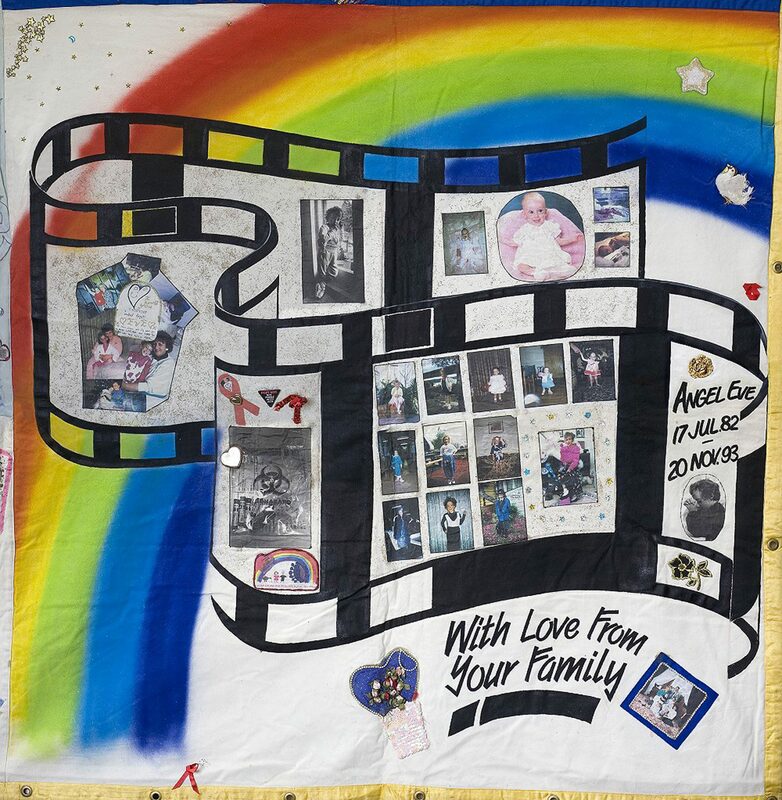 The black and white photo shows Eve at three years of age – the year of her HIV diagnosis (Eve had received contaminated blood from one of fifteen units of blood given to her during her first three months of life), and going public to fight for her rights in society. Mother and daughter profile starts from birth, breast feeding and throughout her life until the last photo which was taken the night before Eve’s demise. This profile makes a statement in that as a mother I nurtured her from birth to death with intimate, caring and forever close contact always, and I, as Eve’s mother, have tested negative to HIV with the most recent test done in October 1994. The next clip is just making an AIDS statement, “Fight AIDS not People with AIDS”, use condoms, support from the Kiwi Kids with AIDS Trust which was set up in 1991 by Eve and myself, Gloria. Finding a cure and the red ribbon of remembrance to all those that HIV and AIDS affects, along with Eve’s Golden Heart Award. The final clip is a year by year profile of a very happy, exciting, loving, precocious and wonderful child. The last photo was taken on her eleventh birthday; a rock and roll party shared by many friends and family, just four months before she was taken to be an Angel on the 20th November 1993. MUMMY, DADDY, PETER, DANA, KARL, CHARLOTTE, BILLY, TIMOTHY, and BLACKIE, FLUFFY and BO PEEP.